Sutter General Hospital is bathed in red for National Heart Month. Even the lights in the middle portion of the hospital meet to form red hearts! SACRAMENTO – Sutter General Hospital had commuters seeing red Thursday night … but in a good way. The hospital is celebrating American Heart Month and the American Heart Association’s National Wear Red Day Friday, Feb. 7, by bathing the hospital’s side facing the Capital City Freeway in red light. The red glow will continue each night through Feb. 13. While Sutter General Hospital may be the most visible due to its proximity to the freeway, several other Sacramento buildings, businesses and community groups are going red and participating in “Go Red” activities to help draw attention to heart disease being the No. 1 killer of women. SACRAMENTO – Sutter Medical Center, Sacramento was named one of the nation’s 50 Top Cardiovascular Hospitals for the second year in a row by Truven Health Analytics, a leading, unbiased provider of information and solutions to improve the cost and quality of healthcare. Sutter Medical Center, Sacramento is the only hospital in the greater Sacramento region to be honored; the only other Northern California hospital to be listed in the Top 50 is in Mountain View. The 2014 awards singled out 50 hospitals that achieved superior clinical outcomes, and these outcomes in turn saved money. The 50 Top Cardiovascular Hospitals spent roughly $2,000 less per bypass surgery and about $1,000 less per heart attack patient admitted. The winners were also quicker to release their patients: a half day better than their peers for heart attack, heart failure and angioplasty cases, and a full day sooner for bypass patients. •	8,600 additional lives could be saved. •	$1 billion could be saved. •	3,200 additional bypass and angioplasty patients could be complication-free. SACRAMENTO – George Vaughn, 45, of Sacramento never had heart trouble. On Sept. 4, that changed quickly … and dramatically. While taking a shower that morning, Vaughn had a cardiac arrest and fell unconscious, which awoke his wife, Lily. She had CPR training nearly 20 years earlier and remembered enough to keep him alive until first responders arrived. Lily Tang talks about keeping her husband, George Vaughn, left, alive through CPR while Sutter Heart & Vascular Institute Medical Director David Roberts, M.D., right, and Subramaniam Krishnan, M.D., who performed a procedure that saved George’s life, listen during an event when Lily received a American Heart Association Heartsaver Hero Award. When he was brought to Sutter Memorial Hospital, Vaughn was in a ventricular fibrillation storm – a constant series of cardiac arrests – and had to be shocked at least three-dozen times in the emergency room. Various medications were given to halt this lethal arrhythmia, but nothing was working. He was brought into a cath lab that doubles as a surgery room, and a team of about 20 clinicians – including interventional cardiologists and heart surgeons – worked quickly to try to stop the storm. While there, Vaughn received continuous shocks as the storm worsened. It is estimated his heart was shocked more than 200 times. SACRAMENTO — Subramaniam C. Krishnan, M.D., FACC, medical director of Arrhythmia Services for Sutter Heart & Vascular Institute, was honored by the American College of Cardiology for developing and directing electrocardiography training classes for physicians in India earlier this year. He led a team of physicians from the United States that toured different cities in India in June. 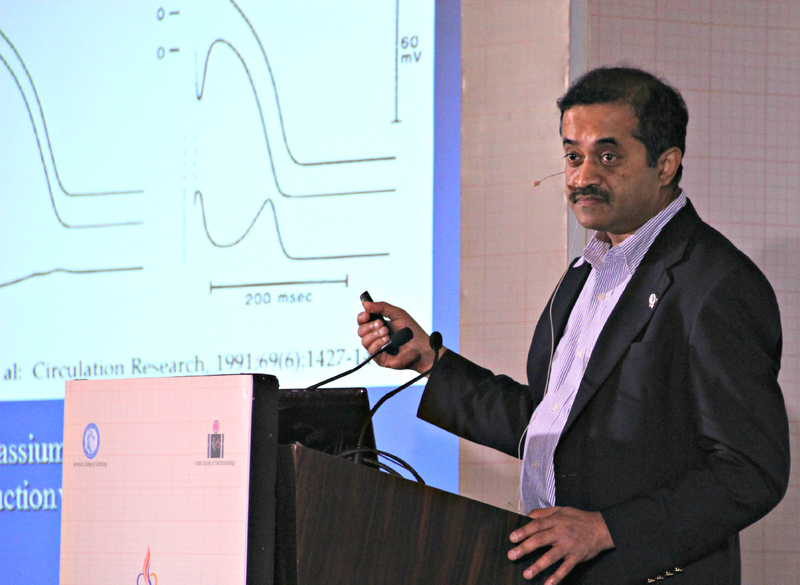 Dr. Krishnan leads an ECG training in India this past June. Ron Walters, 66, of Santa Maria, Calif., became the first patient in the greater Sacramento region to be implanted with a new, smaller mechanical heart pump that will keep him alive until he’s healthy enough for a heart transplant. This new, smaller left ventricular assist device will keep his heart pumping and allow Mr. Walters to get stronger and healthier in order to move up on the heart transplant list. This new ventricular assist device – called the HeartWare® Ventricular Assist System – was recently approved by the FDA, and Sutter Medical Center, Sacramento was the first hospital in Northern California outside San Francisco to use it. Sutter Medical Center, Sacramento has the greater capital region’s only heart transplant center and is the only cardiac program that can utilize this new technology. With the HeartWare pump, Sutter surgeons will be able to keep more heart-failure patients alive for heart transplants, possibly including children and smaller adults who couldn’t be implanted with the larger left ventricular assist devices. Robert Kincade, M.D., surgical director of the Heart Transplant Program, and John Chin, M.D., medical director of the Heart Transplant Program, said that, with this device implanted directly into the chest, Mr. Walters will be able to resume normal activities until a heart becomes available for him. SACRAMENTO – Sutter Medical Center, Sacramento, designated an Advanced Primary Stroke Center by The Joint Commission, received the American Heart Association/American Stroke Association’s Get With The Guidelines®-Stroke Gold Plus Quality Achievement Award during a presentation Tuesday. The award recognizes Sutter Medical Center’s commitment and success in implementing a higher standard of care by ensuring that stroke patients receive treatment according to nationally accepted guidelines. Sutter Medical Center, Sacramento’s stroke team poses with the Gold Plus award along with CEO Carrie Owen Plietz, second from right.